A couple days ago, I was doing a pre-interview for an upcoming Polycom on Demand podcast. 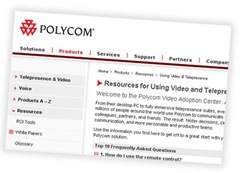 The topic revolved around a new resource Polycom has placed on their website that provides a one-stop location meant to help their customers better implement (or propose) a video conferencing environment. As I was learning about this resource, I discovered that within their “Tools” area, they had included links to a couple previous Polycom on Demand podcast episodes. I thought this was a great idea. By integrating their existing podcast content into this new customer offering, they’ve enhanced both the podcast’s standing as a valuable educational tool for their customers and the ability to deliver timely, helpful content via their online presence. This is a great use of their podcast. And if you haven’t begun podcasting yet, don’t forget that there is more to it than just creating a new MP3 file for your customers. With the release of each new show, we provide each customer with a long list of ideas on how to promote/leverage that particular episode. I’d suggest that besides simply posting your latest episode on your server, think hard about how else your podcast can help move your story forward and shorten your sales cycle. Now, I have a looooong list of other uses for podcasts. But I’d like to hear from you. How do you put your podcast to work for you? Let’s take turns sharing some ideas! You see, prior to making the episode available, we spend time researching the customer’s corporate website looking for pages that relate to the episode in question. We gather the URLs from the corporate site and list them for the customer…so that they can add links to the podcast episode from those URLs we listed. Pretty simple, don’t you think? But you’d be surprised how many companies don’t take the time to do it! As an added value, site visitors love getting the behind the scenes vibe for a particular subject that a podcast often provides. And, you’re providing SEO juice to your podcast as well! What do you think? Do you have other ideas for promoting your corporate podcast? Let’s hear ’em!